14: Pig Rearing or Not!! On the eve of 2011, changes will be needed. Our Chairman is moving to Scotland. Dave Valentine, after 11 years of selfless service to the SCA has had enough. He has asked repeatedly for assistance with the newsletters, to no avail, and has had an annus horriblis in 2010, losing his partner Viv and suffering ill-health which has not yet cleared. 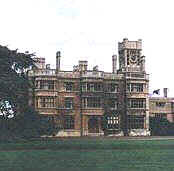 The Shuttleworth College Association (SCA), once known as the SCOSA [Shuttleworth College Old Students' Association], was formed to enable members to keep in touch with both the College and their peers when they left the college and as history has shown went to almost every corner of the world. Elsewhere on this website you will find more about our history; the changes that have taken place in recent years to The College and The Trusts; the current Committee personnel; the latest news, and future events / plans. Following the changes, which involved the Shuttleworth combining with Cranfield as far as student activity was concerned and then Cranfield pulling out of the Old Warden campus, our Association nearly folded. It is thanks to a lot of hard work by many members of the SCA committee that we are once again on a sound financial footing. With the last few years behind us we can now concentrate on the original purpose of our association. That is to keep in touch with members and to enable them to keep in touch with fellow members of their courses. To this end we are once again publishing the annual Newsletter. This is now by subscription and the form to subscribe is elsewhere on the site. We will try to keep all members posted via this site with as much information as come to hand, but it is far better to keep in touch with your Course Rep and to subscribe to the magazine. All members' ideas for meetings and reunions by course, location or national will be welcomed, as will copy for the magazine. If you meet an ex student then check that they are in touch with us and ensure that we have their current address etc. A list of known members for any individual course can be sent to any ex-Shutts student. Some subscribers have moved and forgotten to tell us. If you have paid and do not receive the newsletter - contact us .